SIKESTON, Mo. – There is something magical that happens when a man goes face to face with a bull and comes away unscathed. It’s not exactly sleight of hand, but it’s inspiring to say the least. That’s the epitome of the men that are part of Bullfighters Only, which will feature two nights of freestyle bullfighting action Aug. 10-11 during the Sikeston Jaycee Boothill Rodeo at Art Saunders Arena. That’s true. The freestyle bullfights are not new to the fans in Sikeston. For years, it was part of a tour that ended nearly two decades ago. Bullfighting returned to the event two years ago, and this year is part of the BFO’s inaugural tour. 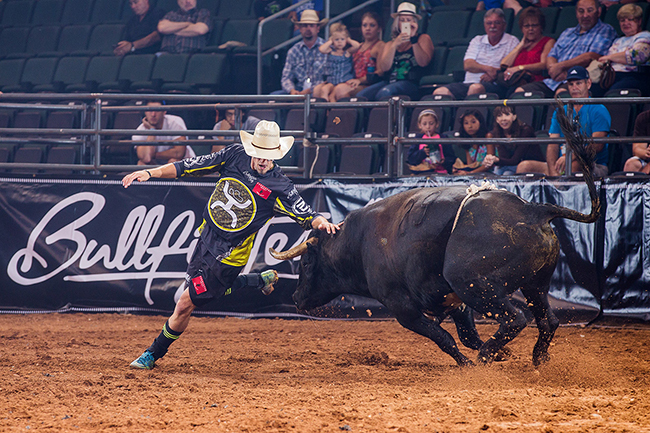 Bullfighters Only has created a public demand for the sport, and it’s working. Sikeston is just one of many prestigious ProRodeos that is part of the BFO tour. “It’s crazy to think this is our actual first year and that we have so many events at these historic rodeos,” said Chuck Swisher of Dover, Okla.
With scores based on a 100-point scale, men can earn up to 50 points per fight based on their ability to exhibit control and style while maneuvering around or over an animal; a bull can earn up to 50 points based on its quickness, aggression and willingness to stay with the bullfighter. In Sikeston, Rutkowski and Swisher are just two of five men who will be part of the competition. They will compete in two go-rounds, and payouts will be based on how well the bullfighters do in each round and in the two-fight aggregate. The man with the best two-bout cumulative score will be crowned the Sikeston BFO champion. Nobody understands that more than Rutkowski. Though he has one title under his belt this season, his consistency has paid off. Like all the other bullfighters in the BFO, he wants his name on the No. 1 line when the season concludes. In fact, the men themselves were the guiding force behind the creation of Bullfighters Only. It was developed a little more than a year ago, and it has seen rapid growth. That’s been a good thing for the BFO and the world’s best bullfighters. “The really cool thing about freestyle bullfighting is that it’s just really simple to understand,” said Ross Hill of Muscle Shoals, Ala., who will be one of the five combatants in Sikeston. “It’s a game of cat and mouse, except the mouse weights a lot more than 20 pounds and can flat run over you. It’s easy to follow, and it’s a little more self-explanatory than some extreme events. It’s a format that has been working all season long, and it’s expected to be quite the showcase in Sikeston.